When I received these cycling shoes from Pearl iZumi, my first impression was how sharp they look. But when I picked them up I also quickly noticed that They’re really light — 275 grams (9.7 ounces) of looks and function. Pearl’s P.R.O. Leader shoe is loaded with features that make it a true performer. The unidirectional carbon fiber sole helps it achieve ultra-light stiffness. Does it make a difference on the bike? You bet. It transfers more power to the pedals, with no hot spots. For optimal comfort, the P.R.O. Leader has a built-in longitudinal arch support with vents that allow air to flow through — including three vents in the sole. The arch support is fine for folks with normal arches, but I have very high arches and need more support. 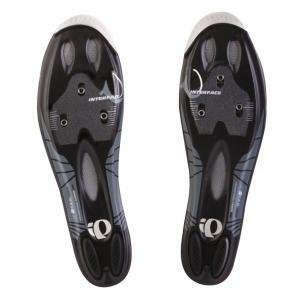 I use Aline sport insoles, which fit perfectly in the shoe. The P.R.O. Leader buckle allows you to ratchet in the right amount of snugness for your foot. An additional feature that helped me get the perfect fit is an adjustable instep strap. You can choose from three placements on the instep strap, depending on the size of your foot and your specific instep. The heel cup, also made of synthetic leather, holds your heel comfortably in place, adding to your power transfer to the pedals. You still may walk like a duck wearing the SPD-SL (or other 3-hole) cleats, but the pronounced heel bumpers (one on each side of the shoe, vs. a single one in the middle) make balance and walking a little easier. Because of my small feet and high arches, I’ve always had problems with cycling shoes on long rides in hot weather. I often suffer from hot spots and swollen feet. Not anymore. With these shoes, my feet have never been happier on the bike. Pearl iZumi shoes come with a 60-day fit guarantee. If you’re not happy with the fit during that time you can return them for a refund. But with this degree of adjustability, you’re not likely to be looking for a refund. 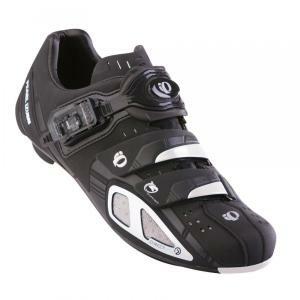 Bottom line: This is a great pair of cycling shoes — functional, adjustable and comfortable. Laurel-Lea Shannon is publisher of www.WomensCycling.ca, which contributes the Women on Wheels column that runs occasionally in RBR Newsletter.